In the midst of all that is going on with me health wise we are starting to undergo another transition. Mom and Dad have lived in New Baltimore, NY for over 48 years. It is the only family home I have known. There is a picture of mom holding me on the back patio as they brought me from the hospital to their new home. 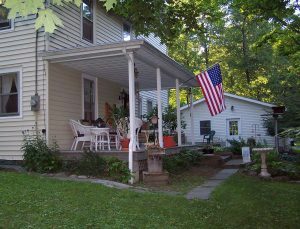 Over the years there have been many great memories and there are plenty of stories to tell about the time we spent in that home. The time has come to start a new chapter in life and say goodbye to that very special place. There is a new young family who have purchased the home and will begin to make their own memories and stories there. I pray they find their time at the home as rewarding and enriching as our family did. Mom and Dad have decided to move closer to Nancy, Rayann and myself. They are in the process of purchasing a home in the next town over from ours. It will be exciting to have them near us for the first time since I left home at 18. Needless to say the transition is not necessarily easy. It is hard to leave behind all that you know and have worked to create…even though you believe it to be the right thing to do. My brothers and I have worked closely with them to help them prepare and be ready to move. Moving day is quickly approaching. This time next week Nancy and I will be in NY helping Mom and Dad pack up some final items and then traveling with them back down to PA. There will be a few weeks where they will live with us as we walk through the closings on the home in NY and then here in PA. Mom was quite the poet! In the midst of their packing Dad has spent hours going through his office and the files he has kept for the past 48 years. On their 54th anniversary Dad brought down a piece of family history. 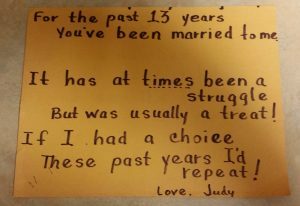 He shared a hand made anniversary card my mom had given him 41 years ago! Nancy and I have moved nine times in our marriage and ministry. One of the things we have learned is that each time you move you it is an opportunity to clean house and eliminate those things you really do not need. We have worked to minimize our possessions. One of the casualties of living this way is that you often lose little items like my Dad has kept for the past 41 years. It is hard to imagine packing up all those memories at one time. 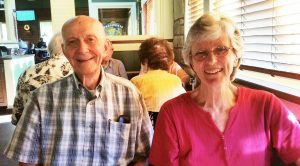 Mom and Dad are doing very well in the midst of the chaos and transition. It will be good to finally have them settled and in their new home.